A northern Colorado water official expressed concern this week that talks of bringing more Western Slope water across the Continental Divide might take a backseat to other aspects of the long-term, comprehensive Colorado Water Plan. The statewide water plan — put in motion by Gov. John Hickenlooper and expected to be complete in 2015 — takes into account all aspects of water use in the state, such as further conservation efforts and new water-sharing arrangements between cities and agriculture, among many other efforts aimed at avoiding the large water shortages the state is forecast to face by 2050. A number of things have been agreed upon in the talks, but building new water-supply projects has long been a hot-button issue — particularly projects that would bring water from the Western Slope to Eastern Slope users. Discussions between representatives of all of Colorado's river basins on Tuesday and Wednesday in Loveland made limited progress on the topic. During the meeting, Eric Wilkinson, general manager of the Northern Colorado Water Conservancy District in Berthoud, expressed concern Tuesday that, because of its controversial nature, trans-mountain water diversions seem to be taking a backseat to other aspects of the long-term water plan. Wilkinson stressed that without more water going to Eastern Slope users, agriculture in particular will suffer. "We've gotten awfully good at taking water away from agriculture," said Wilkinson, referring to the ongoing buy-and-dry issue taking place in Colorado, particularly on the Eastern Slope. The purchasing of water rights from ag producers leaving the land is a comparatively inexpensive way for cities to acquire needed water. Because of that, however, Colorado is on pace to see as many as 500,000 to 700,000 acres of irrigated farmland dry up by 2050, according to the Statewide Water Supply Initiative study, released in 2010. With much of Colorado's ag production taking place in northeast Colorado — particularly in Weld County, which ranks in eighth in the nation for its production — it's the region that could be hit the hardest. "If we investigate the possibility of bringing more water over here from the West Slope, and we're told 'it can't be done,' that's fine," Wilkinson said in an interview after the meeting. "But we at least need to be looking into it … and putting as much effort into that as we are other things, like conservation, and every other leg of the stool in these water talks." 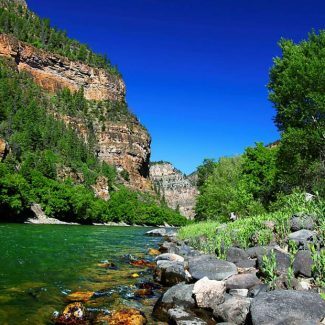 A commitment in the Colorado Water Plan to at least explore trans-mountain water diversions could help such projects, if feasible, get off the ground quicker, which is vital, Wilkinson said, considering that those projects — when factoring in planning, permitting and actual construction — take decades to complete. The disagreement over trans-mountain water diversions between Eastern Slope and Western Slope water officials and users goes way back. About 80 percent of the state's population lives on the Eastern Slope but about 80 percent of the state's water supplies — primarily snowmelt in the mountains — sits on the West Slope. To meet the needs of the growing Front Range and northeast Colorado's robust ag industry, Eastern Slope water providers have long built projects that bring water across the Continental Divide. There are now more than 30 such projects bringing about 450,000 to 500,000 acre feet of water each year from the Western Slope to the Eastern Slope, Wilkinson noted. Many on the Western Slope have expressed concern and want the Eastern Slope to stop diverting more of its water. While only about 20 percent of the population lives on the Western Slope, the Western Slope has its own water demands to meet, mainly its legal obligation to make sure several states downstream from Colorado receive certain amounts of water. Meeting those needs, while also contributing to those of Colorado's Eastern Slope, is stretching the Western Slope thin, water officials from that part of the state say.